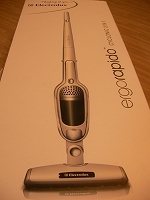 This is a wireless cleaner "ergorapido" by Electrolux corporation. This cleaner's biggest merit is there isn't any wire to the electric source. This means you don't need to change the plug every time when you move to another room. Smaller head part can move to 90 degree front side and back side, and also 180 degree to the left and right side too. This flexibility realizes smooth movement of this cleaner. But most impressed point is this beautiful design. ergorapido Ergorapido's design level is evaluated from all over the world and they got a prize of iF Product Design Award and reddot Design Award 2008. 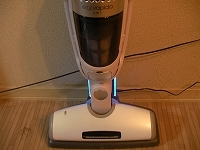 You can put this cleaner in the living room without incompatibility because of this high level design. I just opened from the box. I decided white color same as my room's wall color. Maybe someone might be thought how it works? 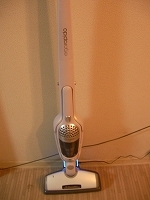 It's totally different from usual cleaner, ergorapido works with charging battery. Right hand side picture shows it's charging on the docking part. While it's charging, blue diode will shine and once it charged full, it can work about 25 minutes. I thought it was little bit shorter, but I think if you cleaned floor while 20 minutes, it's enough to clean it all. It's better than always take out from the storeroom if I wanted every time. 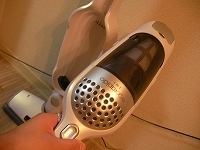 This cleaner has a cyclone system, so vacuuming power is also strong enough. Moreover, it doesn't use dust paper pack, so it's good for the eco too. Another funny function is this. This cyclone part can remove from the main frame, and it can use it for the handy cleaner too. You can use it for difficult place to clean with main cleaner or for example you can bring it to the car and clean the seat easily. Ergorapido has loaded both design and functionality created by the Electrolux corp. This amazing cleaner is still on the way to expanding in the market, so it's still difficult to find it in the usual electric appliances store. I hope this kind of cleaner will spread more in the future. If you want to know about this cleaner or person who want to get it, please visit this website. And I found cheaper one selling in the Rakuten market in this site.